During the next weeks I’m not able to work on the pluigns, but I do my best to solve bugs very quick ! Wish you all a nice start in the week…. And if you like to know what could be a nicer , cleaner admin interface for NextGEN Gallery, then have a look at this discussion. Your feedback is important… ! I was never a friend of this ads, but the major increasing of the traffic on this page (last month more than 100 GB), required a more expensive account and I take the ads income as balance for that. Today I saw on wordpress.org that NextGEN Gallery reached the download rate of WPG2 – the Gallery2 integration. So what is behind is numbers ? WPG2 is a very good and easy to handle plugin for the best gallery system you can hosted on your own server (FlickR and Picasa are defined as external solutions). 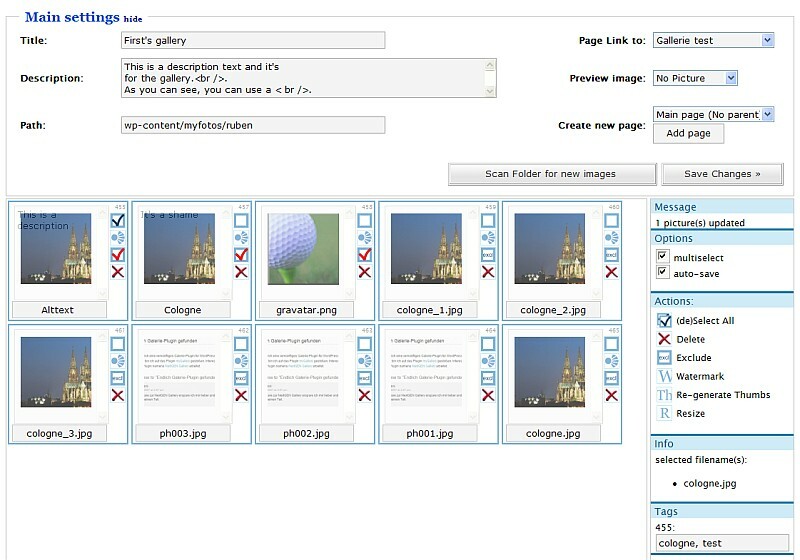 Gallery 2 is by far the most complex PHP gallery solution, I often call it the Typo3 of gallery system. When I start to study the success of WordPress, I saw that the backend administration is the key to the success. WordPress is complex, but when you visit the first time the backend panel and play around with the option you don’t need to study any documentation. Uh, the switch to the new server has a real bad effect : My memory consumption is increased nearly 2 times. If you read this article , you can see that I have under Apache 2.0.48 / PHP 4.3.x (doesn’t remember) around 10,7 MByte memory usage, now it’s 20,35 MByte ! My web hosting company activate too much modules… 😦 and didn’t accept a higher memory limit than 32 MByte.